You can join one (or more!) of these groups! Become an interest group member to become more engaged with our League mission: Empowering Voters, Defending Democracy. At its October 3 meeting, the LWV-WA board adopted a policy presented by Action and Advocacy Coordinator Linda Rice to guide interest groups. The policy describes what advocacy efforts members may undertake in support of positions that the League has reached through research, dialogue and consensus. The policy, including guidelines for interest groups, can be accessed here. Several local League interest groups have formed to focus on League priorities. Each group will meet regularly to conduct research in depth, track relevant legislation introduced in the General Assembly (GA), and advocate, either in support or opposition, with our legislators during the GA session. Interest groups may organize panel discussions on topics of general interest that the group identifies. Fall reception attendees had an opportunity to join individual groups; some committees are complete, others actively seek additional members. Nine members have joined the Election Integrity Committee; no more are needed. I chaired the recent state study on Behavioral Health that resulted in an expanded state position; our knowledgeable committee will continue its advocacy work. The Education interest group, Loretta Hannum, Susan Nelson, Laura Tripp, and Sudie Watkins, will select a chair at their first meeting; additional members are welcome. Christine Payne is the point of contact for advocacy on Gun Safety legislation. Jo Solomon is our League liaison to the LWV-VA Redistricting Committee. The state League has been an active partner with OneVirginia2021 since its inception in 2013. The League supports passage of the Equal Rights Amendment, and your involvement in VAratifyERA.org would be welcome. Contact Linda Rice with questions. Why do Americans choose to vote—or choose not to exercise that most basic right? And how do we as League members help to reduce the divide between voters and nonvoters? Mediocre voter turnout has become the trend in America despite warnings that “democracy is not a spectator sport.” Voter turnout in the U.S. is among the lowest in the world, having declined sharply since 1900. Many people consciously choose to stay on the sidelines of democracy; others find formidable obstacles to exercising their right to vote. Reasons are many: people say they are too busy, don’t like their choices or don’t know enough to vote. Many are focused on getting to work or paying their rent. In many states voter ID restrictions keep people from voting. Too many do not realize that midterm elections also carry enormous political stakes. For example, governors and state legislators elected this fall will determine redistricting decisions following the 2020 census. Young first-time voters may show up at the polls on November 6. But many youth are suspicious of politicians and political parties – as are many other citizens. 1914 was the last time that more than half of eligible voters turned out for a midterm election. Only 33 percent of eligible voters voted in the 2014 midterms; among18-29-year-olds about 20 percent cast a ballot. Polls focused on “likely voters” predict that just 37 percent of young voters will vote in the upcoming midterms. There is a “renaissance of political engagement” among some Americans experiencing a new civic spirit—calling their elected officials more often, marching in opposition to or in support of causes, donating money, running for office and joining organizations such as the League of Women Voters. Partisan and racial gerrymandering has energized many voters in Virginia and other states where voters are demanding that they pick their legislators, rather than legislators picking their voters through gerrymandered district lines. The League of Women Voters, NAACP, numerous churches, campus groups like Vote21 and political parties have worked to register voters for the fall elections. On National Voter Registration Day, September 25, a record 800,000 new voters registered. But far surpassing that is the number of voters who have been purged from voting rolls in many states or barriers imposed to reduce participation at the polls. So what can League members do to further our mission to Empower Voters and Defend Democracy? Encourage friends and family to be informed voters by seeking opportunities to hear directly from candidates. Promote the League’s online resource, Vote411.org, where voters can compare candidates’ responses to questions. Offer to assist in getting voters to the polls. Work to reduce onerous ID requirements. Long-term, support making Election Day a national holiday. And to those cynics, who believe that their one vote does not matter, remind them that a tie election in 2017 saw the Virginia House of Delegates majority determined by the drawing of a name. Every election, the League of Women Voters sends identical questions to candidates for office. See the responses of the Senate candidates for Virginia here. Go to vote411.org for more. The following formatting is excerpted from The League of Women Voters of Fairfax Voters’ Guide. VOTE411.org’s content is duplicated in this publication. Chairman for the Donald J. Trump for President campaign. He is an International Trade Attorney in private practice. I. What policies and resources do you propose to ensure election integrity and security in the United States? Tim M. Kaine: The recent Omnibus bill that passed earlier this year included an additional $307 million for the FBI’s work to secure the 2018 U.S. midterm elections and fight against future Russian cyberattacks. The bill also provided $380 million for the Election Assistance Commission to increase cybersecurity for state voting systems and protect elections against foreign interference. We need to ensure that we are doing everything we can to protect our elections systems from cyberattacks. In addition, we need to ensure we are protecting all critical sensitive information from being hacked, such as: health, education, and banking infrastructure. States hold the majority of sensitive information. Virginia has been at the forefront of ensuring that we are taking all steps necessary to protect our infrastructure from any potential attack. I also strongly support states and localities taking the necessary steps to back up their elections with paper ballots. Corey Stewart: I fully support voter ID laws, which serve to prevent various kinds of election fraud: impersonation fraud; registration under fictitious names; voting in more than one state; and non-citizen voting. States that have enacted this commonsense reform found no depressing effect on voter turnout. Matt J. Waters: The Constitution is clear on the issue: 15th & 19th Amendments secure the right of citizens to vote. Congress has the power to enforce this via legislation. II. What policies, e.g. tariffs, taxes, tax cuts, do you propose to promote economic security for all Americans? bill that would put middle-class families and small businesses first. Instead, Republicans jammed through a bill that will raise taxes on millions of Americans. We must give more of the benefits to the middle class instead of big corporations. I introduced an amendment to this bill to provide long-term middle class tax relief and reduce the amount the bill adds to the deficit. Republicans blocked my amendment. I also have strong concerns with the President imposing tariffs on our major allies, resulting in steep tariffs being imposed on Virginia products. I have urged the President to reverse course and make it clear to our allies that we are honest brokers. Corey Stewart: President Trump’s tax cuts have already done much to promote economic security for all Americans – with black, Hispanic, Asian and youth unemployment now at all-time lows. I would vote to make these tax cuts permanent. I additionally support President Trump’s efforts to renegotiate unfair trade agreements with other nations, in the best interests of American workers. contract between government and the people. III. What is your position on using a citizenship question on the 2020 Census survey? Tim M. Kaine: I am opposed to asking individuals whether or not they are citizens on the 2020 Census survey because it will result in fewer people being counted or participating in the process. The rhetoric coming from this administration is sending fear into communities of color and this could lead to a distortion of who is residing in the U.S. Data collected by the Census is essential in bringing federal dollars and determining the political representation of our communities. The federal funds are distributed to state and local government to support schools, health care, housing, and other vital public benefits. There are about 300 federal programs that use Census data to determine how and where the money is spent. The Census occurs once every ten years and it is critical that we get a complete and accurate count. For these reasons, I oppose including a citizenship question on the 2020 Census survey. Corey Stewart: I support reinstating the citizenship question on the 2020 Census survey. Electoral seats should be determined according to the population of actual citizens, not total population size. Matt J. Waters: This is entirely in the purview of the Congress according to Section 1 Article 8 of the Constitution. IV. What are your proposals for an immigration policy? immigration, travel bans, and all attempts to separate families. Earlier this year, I worked with my colleagues in the Senate to find a solution to protect Dreamers, create a pathway to citizenship, while protecting our borders. Corey Stewart: Immigration should be managed in a way that benefits our nation. I would end the Visa lottery in favor of a merit-based system. We should have zero tolerance for illegal alien crime. I favor the prosecution of state and local officials who brazenly flout our nation’s immigration laws by declaring “sanctuaries” for illegal aliens. Finally, I would vote to fund construction and maintenance of a true wall, to stem the flow of migrants and contraband across our southern border. Wall for financial and results oriented reasons (It won’t solve the problem). I believe we need to change the laws on chain migration. 70% of all immigration to US are relatives coming to live here. I would advocate moving to a merit based system based on skills and America’s labor needs. I support E-verify, and tighter border security. I also support renewable work permits for non-US citizens working in the US, as this will raise salaries of non-US citizens such that they would not undercut current worker salaries. V. What do you propose to ensure high quality, affordable and accessible health care? help reduce the cost and incidence of chronic diseases. Since passage of the ACA, more than 300,000 Virginians have gained access to quality affordable health care through its federally-run exchange. I have supported legislation to continue to expand health care coverage and make important fixes to the ACA. I also introduced the Medicare-X Choice Act which would create an affordable public option, so Americans could choose whether to purchase one of the existing private plans on the exchange or a Medicare-X public plan. “no-frills” plans. We should allow insurance plans to be sold across state lines (more competition is healthy). Ultimately, we need a free market, consumer-driven health care system that puts the needs of patients first. Medicaid. I favor allow companies to compete for consumer business not unlike other businesses, and for customers to choose between multiple health care offerings, or none at all. VI. What policies do you propose to reduce gun violence? personnel – perhaps retired police officers – to protect our nation’s schools. VII. 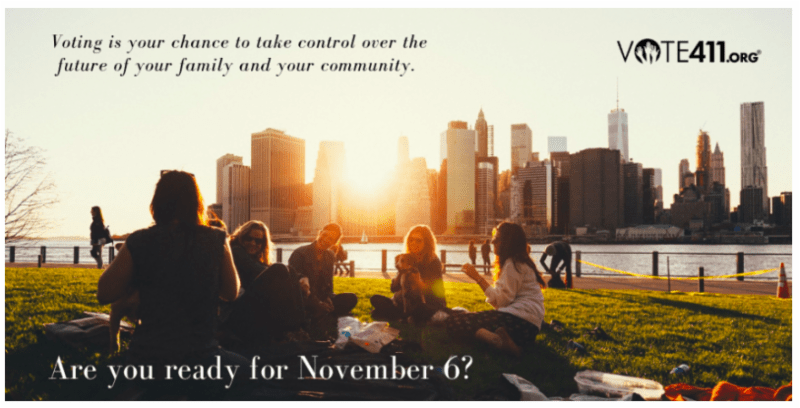 What are your legislative priorities? Facebook page, www.facebook.com/lwvfairfax, twitter.com/LWVfairfax, or at LWVUS www.vote411.org. The Williamsburg League is developing a new Action and Advocacy Policy, drafted primarily by board member Linda Rice. Scroll down to read it or click here to open in a separate tab. Definition: Action includes both advocacy and lobbying. Lobbying is an attempt to influence specific legislation, either proposed or already introduced. LWV-VA has an official lobbyist who is given authority to speak on behalf of the state league. However, members of local Leagues can advocate for an issue(s). Advocacy consists of activities that educate legislators on particular issues which affect their members and helping them find solutions to persistent problems. When League members visit legislators, they need to indicate that they are expressing their views as individuals and not officially representing the League. Telling your member of Congress how a federal grant your organization received has helped your constituents. Educating a member of General Assembly about the effects of a policy on your constituency. Asking your member of Congress or the General Assembly to vote for or against, or amend, introduced legislation. Emailing a “call to action” to your members urging them to contact their member of Congress in support of action on introduced legislation or pending regulations. When done effectively, advocacy influences public policy by providing a conduit for individuals and organizations to voice an opinion. These efforts can, in turn, sway public opinion, garner press coverage, and ultimately provide policymakers an opportunity to respond to constituents’ needs. Pre-session Roundtable meeting, usually the first Wednesday in December. Women’s Legislative Roundtable meetings, usually every Wednesday during the legislative session. Suggests items to be included in president’s testimony and prepares or assists with writing the testimony. Convene panel discussions open to members and the general public about issues such as but not limited to election integrity, education, gun reform and redistricting. Identify speakers with expertise in the above issues or other issues. Use video resources to enhance public understanding of the above issues or other issues. William and Mary president Katherine Rowe was the featured speaker of our fall membership meeting. Read the Virginia Gazette Coverage here! Katherine Rowe, president of the College of William and Mary, said the school was celebrating 100 years of women at the college. Rowe said while changes were happening at the college, Virginia, its home, rejected the ratification of the suffrage amendment in 1920. The Commonwealth did not symbolically ratify suffrage until 1952. Rowe discussed student civic engagement and was named the first honorary member of the Williamsburg Area League of Women Voters at its fall membership meeting Wednesday night. One of the reasons Rowe said she felt the current generation of undergraduate students were poised to make an impact on the world was because they were more engaged with their communities than past generations. She added while students are more aware of the immense challenges they have inherited, they are also are still optimistic about searching for solutions. Rowe said she is especially inspired by undergraduates’ sense of responsibility to build better communities. A member of the audience asked Rowe how the League of Women Voters could attract a younger and more diverse membership population. Rowe said she suggested simply asking younger voters what they thought. Another member of the audience asked Rowe about the college’s Neighborhood Relations Committee. She said most people in the surrounding neighborhoods used the committee to complain about issues with college students. The woman asked Rowe if the committee could be used to create more positive interactions between the community and students, rather than just being used as a sounding board for complaints. Rowe said she enjoyed the idea another person had brought up that evening, which was inviting college students over for dinner to get to know them. 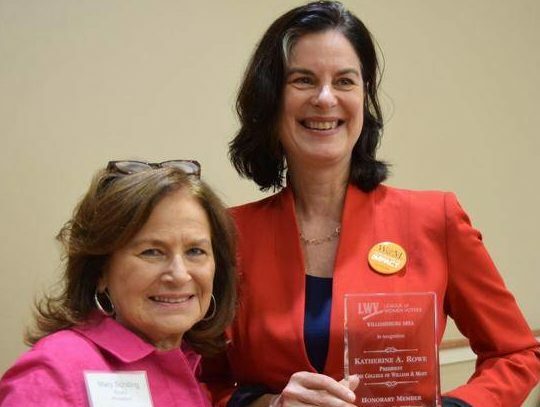 At the end of the night, Mary Schilling, president of the Williamsburg Area League of Women Voters, named Rowe the first honorary member of the Williamsburg League. Rowe reflected on her first memory of voting from when she was 6 or 7 years old. Rowe’s said she was allowed by to follow her mother into a voting booth by their local League of Women Voters. There Rowe looked up curiously as her mother cast a ballot. “It was thrilling to be able to watch an adult vote,” Rowe said. Later in life, Rowe said she volunteered for the Judge of Elections in Philadelphia. 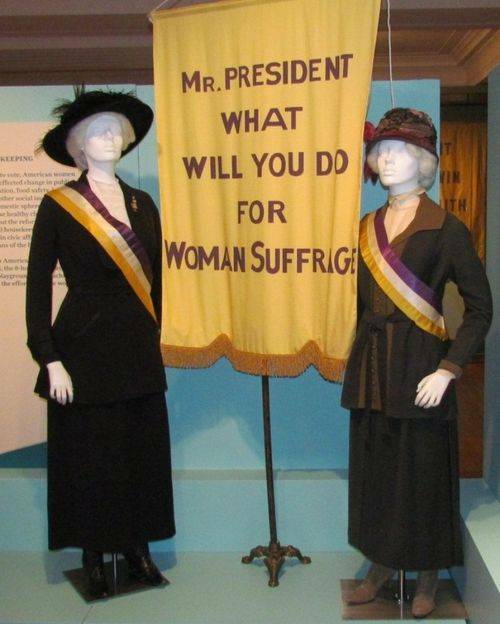 We’re using more purple and gold, in honor of the suffragettes! Looking forward to our 100th anniversary in just a couple of years. Check these links to see what’s on your ballot for Williamsburg, James City County, or York County. You can vote absentee in person in your county’s voting office, or request an absentee ballot to be mailed to you. Scroll down to see where your county voting office is located. James City County "Style 3"
Absentee voting is great if you know you will be unable to vote because of a commitment on Election Day. Deadline to register to vote, or update an existing registration, is Monday, October 15, 2018. Check your voter registration at the official state site. Deadline to request an absentee ballot to be mailed to you is Tuesday, October 30, 2018. Your request must be received by your Registrar by 5:00 p.m. Deadline to vote an absentee ballot in-person is Saturday, November 3, 2018. Please check with your registrar for office hours. York County Registrar’s Office is open Saturday, Oct. 27, 2018 and Saturday, November 3, 2018 from 9 a.m. – 5 p.m. for absentee voting. City of Williamsburg is open Saturday, October 27, and Saturday, November 3, from 8:30am to 4:30pm, for absentee voting. James City County is open Saturday, Oct. 27 and Saturday Nov. 3 from 9 a.m.-5 p.m. for absentee voting. You cannot vote absentee on Monday, November 5, right before the election, unless it is a specific type of emergency, so don’t wait till then! You will need to fill out this piece of paperwork before casting your absentee ballot. You can do it at the office; you can even download the form here and bring it with you. Am I eligible to vote absentee? will be at your workplace for 11 or more hours between 6:00 a.m. and 7:00 p.m.
Before visiting your local registrar’s office, check your registration status or call your registrar’s office (phone numbers available on Virginia voter registration application). Also review the application to insure you have all of the information necessary to complete the process. If you are not already registered, you will have to wait five days after registration before you can be issued an absentee ballot (exception for military and overseas voters only). If you have a Virginia DMV license or ID card, you can register online using our OAB application. Within 45 days prior to the election in which you wish to vote, visit your local registrar’s office to vote absentee in-person. At the registrar’s office, fill out an Absentee Application. You must show an acceptable form of photo ID. To view a complete list of acceptable IDs, please visit our Voting In-Person page. An application completed in person can be made up to three days before the election in which the applicant wishes to vote and completed in the office of the local registrar. The applicant signs the application in the presence of a registrar or the secretary of the electoral board. Some large localities offer satellite locations for in-person absentee voting. Check with your local registrar for locations and times. An applicant generally cannot both register to vote in person and vote absentee in person at the same time. If you register to vote in person, your absentee ballot cannot be issued until five days after you are registered. The only exception is absent military and overseas voters eligible under a federal law. Registered voters who vote absentee in person are subject to the same rules that apply to voting at the polls. If acceptable identification is not provided, a provisional ballot will be offered and the voter is allowed until the following Friday by noon after the election to provide a copy of acceptable identification to the electoral board. Provisional voters receive a notice to remind them of the deadline and right to attend the electoral board meeting. The Williamsburg League’s fall program features The College of William & Mary’s new president Katherine A. Rowe. The October 10 event at Legacy Hall begins at 4:30 pm. A reception will follow President Rowe’s remarks. In July The College of William & Mary began an exciting new chapter; its 28th president is a recognized leader, teacher, scholar, and entrepreneur – and its first woman president. Prior to William & Mary, Rowe held a number of leadership positions in higher education. From 2014 to 2018, she was provost, dean of the faculty, and Sophia Smith Professor of English Language & Literature at Smith College. She is deeply interested in design thinking, entrepreneurship, and the digital humanities and has been nationally recognized as an innovator in higher education. During her tenure, Smith transformed its liberal arts curriculum, greatly increased diversity in faculty hiring, launched one of the first statistical and data sciences majors at a liberal arts college (and the first at a women’s college) and broke national fundraising records for women’s colleges. Prior to joining Smith, Rowe spent 16 years at Bryn Mawr College as an English professor, department chair and director of the Katharine Houghton Hepburn Center for leadership and public engagement. Before that she was an assistant professor of literature at Yale. Rowe is cofounder and former CEO of Luminary Digital Media, which developed a series of educational apps enhancing student engagement and learning of classic Shakespearean texts. Rowe earned a bachelor’s degree in English and American literature from Carleton College and a master’s and a PhD in English and American literature from Harvard. She has completed graduate work in Cinema and Media Studies at New York University’s Tisch School of the Arts. Her areas of research and scholarship include Shakespeare, Milton, Spenser, Medieval and Renaissance drama and media history. Rowe has coached Ultimate Frisbee and led multiple teams to state championships in Pennsylvania. She was a World Ultimate Club Finalist and a Women’s Nationals Finalist. She and her husband Bruce Jacobson have two adult children, Danny and Beah. Unanimously elected by William & Mary’s Board of Visitors in February, President Rowe was officially sworn in on July 2. She describes her goal for her first semester as one of “sustained, strategic listening” to all elements of the community. We are indeed fortunate to have this early opportunity to meet and hear her. Creating a More Perfect Democracy was the theme of the 53th National LWV Convention. More than 1000 League leaders attended the four-day convention that included excellent speakers, workshops, and thoughtful, methodical debate. 1. The LWV National is on sound footing. Two years ago, the financial health of LWVUS was not good; this year, they reported an amazing turnaround with more than $5 million in the black, thanks to strategic planning and a rigorous donor campaign. 2. Membership diversity is a key to sustainable growth. The League’s ongoing Transformation Journey and accompanying Roadmap provide evidence that demographically, the League must change. This initiative was seen as so important that all delegates participated in a seminar, Using Diversity, Equity, and Inclusion Lens to Strengthen Social Impact and Collaboration. a. Immigration Sharing Session: Immigration policies should promote reunification of immediate families; meet economic, business and employment needs; and be responsive to those facing political persecution or humanitarian crises. b. Youth Voter Registration: Learn Winning Tactics. Learn strategies for planning registration events that get the biggest bang for your volunteer buck and help empower young people! a. Engaging Members: Moving individuals onto & up the leadership ladder. b. The Voter Girl Project: A youth citizenship project with the Girls Scouts. e. Why We Should Abolish the Electoral College: Since 1970, the LWV has believed that the Electoral College should be abolished in favor of a direct popular vote. a. Mission: Empowering Voters, Defending Democracy. b. Vision: We envision a democracy where every person has the desire, the right, the knowledge, and the confidence to participate. 6. August 26, 2020. Get ready to celebrate the centennial of women’s suffrage marking a century after the ratification of the 19th Amendment. Our featured speaker at the banquet was Elaine Weiss, author of The Women’s Hour: The Great Fight to Win the Vote. Thank you for the opportunity to be one of your delegates to the 2018 LWVUS Convention.